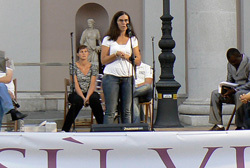 "The Good News in Trieste – music, songs, words of peace", this is how we presented this initiative. 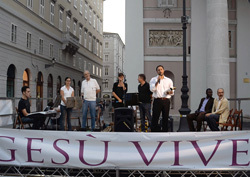 A public evangelization event in ‘Piazza Della Borsa’, well-known as the prime hotspot of the city, also as its economic hub throughout the 19th century. From Friday 9th to Sunday 11th September we announced the Gospel of the Lord Jesus in this place, which previously had never been used for this purpose. To succeed in obtaining the necessary permits, the Lord granted Pastor Veglio Jugovac favour with the local Mayor and the Town Council, whom we thank publicly. 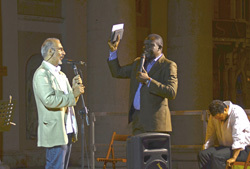 The event was held in the evening, alternating with songs and testimonies. For three evenings, messages were given in English by the Cameroon evangelist Fidele Ntie Kang, with consecutive interpretation by brother Ettore Panizon. Brother Fidele was a researcher at the Science Park Area for about a year in 2008. In that period, during which he actively participated in the spiritual life of our church, a desire to bring the Gospel to Trieste developed in him and, in view of this, he was praying fervently. Throughout the three evenings, the Gospel was preached from the seven words pronounced by Jesus on the cross. Many accepted the invitation for salvation and some were also healed of their physical illnesses and set free from spiritual bondages. At the end of the last day of the evangelization, numerous believers, largely young people, responded to the appeal made by the evangelist for a greater commitment to serve Christ. We thank God for the inspired leading of our minister, Vincenzo Cali, for the remarkably calm weather despite the met office forecast of rain, but above all for the word of truth that has been announced and that by faith we know that it will not fail to produce an effect, as affirmed in Isaiah 55:11: "So shall My word be that goes forth from My mouth; it shall not return to Me void, but it shall accomplish what I please, and it shall prosper in the thing for which I sent it.". Click here if you would like to hear some songs and testimonies. Click here to listen to the beginning of Fidele's preaching. A choice of songs and testimonies given during the outreach follows. Presentiamo una scelta di cantici e testimonianze offerti nel corso dell'evento evangelistico.